Container throughputs handled by PPAP in 3Q18 increased 7.6% YoY (+30% QoQ) to 64,039 TEUs, seeing a single-digit YoY growth for the first time in the last seven quarters. Total container cargoes volume dropped 3.7% YoY (+24.9% QoQ), as container cargoes for imports fell 6.1% compared to the same period last year. According to the company’s report filing on the CSX, this was mainly due to 13% YoY decrease in imports of construction materials and 47% YoY decline in imports of raw materials for the garment industry. While container cargoes volume dropped, general cargoes volume jumped nearly 70% YoY to 182,946 tonnes. However, with strong growth in 1H18, the first nine months of 2018 saw container throughputs grow 14.0% YoY to 158,781 TEUs, with container cargoes volume edging up 2% compared to the same period in 2017. Meanwhile, general and oil & gas cargoes volume rose 40.0% YoY and 8.0% YoY, respectively, reaching 555,837 tonnes and 574,191 tonnes between January and September. With cargo traffic growth slowing down, so was the company’s top-line. Revenue in 3Q18 came to KHR24.0bn, edging up only 1.2% from KHR23.7bn in 3Q17. Two of PPAP’s three main sources of revenue, stevedoring and port services, continue to increase solidly by 8.3% and 7.5% YoY to KHR10.5bn and KHR3.6bn, respectively. However, lift-on lift-off (LOLO), the second largest revenue source that contributed 36% to the top line, fell slightly down 0.2% YoY to KHR8.7bn. Meanwhile, income from other business activities, which altogether constituted no more than 6% of revenue, saw sharp drop. Income from storage service fell 48.2% YoY to KHR321mn, while income from sand dredging service more than halved to KHR14mn. Others (including survey revenue) declined nearly 30% YoY to KHR985mn. Despite core business revenue seeing a modest growth, other non-operating income (financial and rental income) more than doubled to KHR1.45bn in 3Q18 from KHR0.64bn in 3Q17. 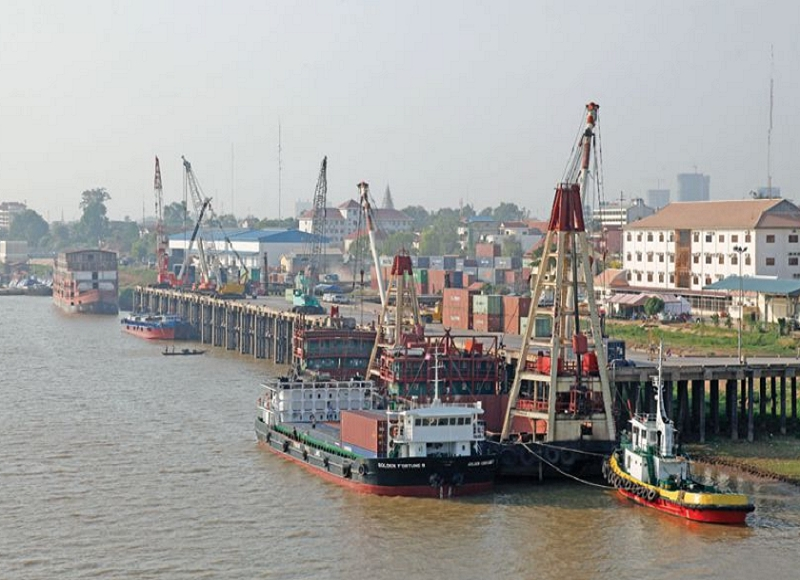 This was thanks to additional rental income PPAP received from leasing its land to Chean Choeung Thai Group (subsidiary of YUETAI Group), and an additional interest income the port operator received from its deposit of the upfront leasing income of $15mn (about KHR60bn) at Foreign Trade Bank (20-year fixed deposits with an interest rate of 7.75% p.a.). Both the leasing and interest income could be expected to add about KHR5.85bn every year to the company’s non-operating income. In the first nine months of the year, revenue reached KHR61.6bn, up 8.0% compared the same period in 2017. Meanwhile, for the same reason mentioned above, other income surged 78.6% YoY to almost KHR3.2bn. EBITDA and EBIT felt slightly, down 1.9% YoY and 2.6% YoY to KHR14.7bn and KHR11.7bn, respectively. While revenue and other income increased by KHR1,106mn, operating expenses rose by KHR1,385mn or 14.8% YoY, driven mainly by 115% YoY jump in repair and maintenance costs, 92% YoY surge in fuel and gasoline expenses, and 10.5% YoY increase in personnel expenses. Between January and September, EBITDA came to KHR33.8bn (+7.3% YoY), while EBIT reached KHR24.8bn (+9.3% YoY). The solid increase in operating profits can be attributed to the significant growth in revenue, rental income and interest income. With financing cost edging up 0.6% YoY, pre-tax profit d ropped 3.0% YoY to KHR10.5bn in 3Q18. However, profit after tax jumped 60.0% YoY, reaching an all-time high of KHR15.4bn in the third quarter. This was due to tax expenses switching sign as a result of substantial deferred tax income related to the origination of temporary difference, occurred as PPAP received $15mn upfront leasing income from YUETAI Group.